FIRST - The remains of monarchial tyranny in the person of the king. SECONDLY - The remains of aristocratical tyranny in the persons of the peers. THIRDLY - The new republican materials in the persons of the commons, on whose virtue depends the freedom of England. The children of Israel being oppressed by the Midianites, Gideon marched against them with a small army, and victory, through the divine interposition, decided in his favour. The Jews, elate with success, and attributing it to the generalship of Gideon, proposed making him a king, saying, RULE THOU OVER US, THOU AND THY SON AND THY SON'S SON. Here was temptation in its fullest extent; not a kingdom only, but an hereditary one, but Gideon in the piety of his soul replied, I WILL NOT RULE OVER YOU, NEITHER SHALL MY SON RULE OVER YOU _THE LORD SHALL RULE OVER YOU._ Words need not be more explicit; Gideon doth not decline the honour, but denieth their right to give it; neither doth he compliment them with invented declarations of his thanks, but in the positive style of a prophet charges them with disaffection to their proper Sovereign, the King of heaven. About one hundred and thirty years after this, they fell again into the same error. The hankering which the Jews had for the idolatrous customs of the Heathens, is something exceedingly unaccountable; but so it was, that laying hold of the misconduct of Samuel's two sons, who were entrusted with some secular concerns, they came in an abrupt and clamorous manner to Samuel, saying, BEHOLD THOU ART OLD, AND THY SONS WALK NOT IN THY WAYS, NOW MAKE US A KING TO JUDGE US, LIKE ALL OTHER NATIONS. And here we cannot but observe that their motives were bad, viz. that they might be LIKE unto other nations, i.e. the Heathens, whereas their true glory laid in being as much UNLIKE them as possible. BUT THE THING DISPLEASED SAMUEL WHEN THEY SAID, GIVE US A KING TO JUDGE US; AND SAMUEL PRAYED UNTO THE LORD, AND THE LORD SAID UNTO SAMUEL, HEARKEN UNTO THE VOICE OF THE PEOPLE IN ALL THAT THEY SAY UNTO THEE, FOR THEY HAVE NOT REJECTED THEE, BUT THEY HAVE REJECTED ME, _THAT I SHOULD NOT REIGN OVER THEM._ ACCORDING TO ALL THE WORKS WHICH THEY HAVE SINCE THE DAY THAT I BROUGHT THEM UP OUT OF EGYPT, EVEN UNTO THIS DAY; WHEREWITH THEY HAVE FORSAKEN ME AND SERVED OTHER GODS; SO DO THEY ALSO UNTO THEE. NOW THEREFORE HEARKEN UNTO THEIR VOICE, HOWBEIT, PROTEST SOLEMNLY UNTO THEM AND SHEW THEM THE MANNER OF THE KING THAT SHALL REIGN OVER THEM, I.E. not of any particular king, but the general manner of the kings of the earth, whom Israel was so eagerly copying after. And notwithstanding the great distance of time and difference of manners, the character is still in fashion. AND SAMUEL TOLD ALL THE WORDS OF THE LORD UNTO THE PEOPLE, THAT ASKED OF HIM A KING. AND HE SAID, THIS SHALL BE THE MANNER OF THE KING THAT SHALL REIGN OVER YOU; HE WILL TAKE YOUR SONS AND APPOINT THEM FOR HIMSELF, FOR HIS CHARIOTS, AND TO BE HIS HORSEMAN, AND SOME SHALL RUN BEFORE HIS CHARIOTS (this description agrees with the present mode of impressing men) AND HE WILL APPOINT HIM CAPTAINS OVER THOUSANDS AND CAPTAINS OVER FIFTIES, AND WILL SET THEM TO EAR HIS GROUND AND REAP HIS HARVEST, AND TO MAKE HIS INSTRUMENTS OF WAR, AND INSTRUMENTS OF HIS CHARIOTS; AND HE WILL TAKE YOUR DAUGHTERS TO BE CONFECTIONARIES, AND TO BE COOKS AND TO BE BAKERS (this describes the expense and luxury as well as the oppression of kings) AND HE WILL TAKE YOUR FIELDS AND YOUR OLIVE YARDS, EVEN THE BEST OF THEM, AND GIVE THEM TO HIS SERVANTS; AND HE WILL TAKE THE TENTH OF YOUR SEED, AND OF YOUR VINEYARDS, AND GIVE THEM TO HIS OFFICERS AND TO HIS SERVANTS (by which we see that bribery, corruption, and favouritism are the standing vices of kings) AND HE WILL TAKE THE TENTH OF YOUR MEN SERVANTS, AND YOUR MAID SERVANTS, AND YOUR GOODLIEST YOUNG MEN AND YOUR ASSES, AND PUT THEM TO HIS WORK; AND HE WILL TAKE THE TENTH OF YOUR SHEEP, AND YE SHALL BE HIS SERVANTS, AND YE SHALL CRY OUT IN THAT DAY BECAUSE OF YOUR KING WHICH YE SHALL HAVE CHOSEN, _AND THE LORD WILL NOT HEAR YOU IN THAT DAY._ This accounts for the continuation of monarchy; neither do the characters of the few good kings which have lived since, either sanctify the title, or blot out the sinfulness of the origin; the high encomium given of David takes no notice of him OFFICIALLY AS A KING, but only as a MAN after God's own heart. NEVERTHELESS THE PEOPLE REFUSED TO OBEY THE VOICE OF SAMUEL, AND THEY SAID, NAY, BUT WE WILL HAVE A KING OVER US, THAT WE MAY BE LIKE ALL THE NATIONS, AND THAT OUR KING MAY JUDGE US, AND GO OUT BEFORE US, AND FIGHT OUR BATTLES. Samuel continued to reason with them, but to no purpose; he set before them their ingratitude, but all would not avail; and seeing them fully bent on their folly, he cried out, I WILL CALL UNTO THE LORD, AND HE SHALL SEND THUNDER AND RAIN (which then was a punishment, being in the time of wheat harvest) THAT YE MAY PERCEIVE AND SEE THAT YOUR WICKEDNESS IS GREAT WHICH YE HAVE DONE IN THE SIGHT OF THE LORD, AND THE LORD SENT THUNDER AND RAIN THAT DAY, AND ALL THE PEOPLE GREATLY FEARED THE LORD AND SAMUEL. AND ALL THE PEOPLE SAID UNTO SAMUEL, PRAY FOR THY SERVANTS UNTO THE LORD THY GOD THAT WE DIE NOT, FOR _WE HAVE ADDED UNTO OUR SINS THIS EVIL, TO ASK A KING._ These portions of scripture are direct and positive. They admit of no equivocal construction. That the Almighty hath here entered his protest against monarchical government, is true, or the scripture is false. And a man hath good reason to believe that there is as much of kingcraft, as priestcraft, in withholding the scripture from the public in Popish countries. For monarchy in every instance is the Popery of government. Secondly, as no man at first could possess any other public honours than were bestowed upon him, so the givers of those honours could have no power to give away the right of posterity. And though they might say, "We chooses you for OUR head," they could not, without manifest injustice to their children, say, "that your children and your children's children shall reign over OURS for ever." Because such an unwise, unjust, unnatural compact might (perhaps) in the next succession put them under the government of a rogue or a fool. Most wise men, in their private sentiments, have ever treated hereditary right with contempt; yet it is one of those evils, which when once established is not easily removed; many submit from fear, others from superstition, and the more powerful part shares with the king the plunder of the rest. If we inquire into the business of a king, we shall find that in some countries they have none; and after sauntering away their lives without pleasure to themselves or advantage to the nation, withdraw from the scene, and leave their successors to tread the same idle ground. In absolute monarchies the whole weight of business, civil and military, lies on the king; the children of Israel in their request for a king, urged this plea "that he may judge us, and go out before us and fight our battles." But in countries where he is neither a judge nor a general, as in England, a man would be puzzled to know what IS his business. The nearer any government approaches to a republic the less business there is for a king. It is somewhat difficult to find a proper name for the government of England. Sir William Meredith calls it a republic; but in its present state it is unworthy of the name, because the corrupt influence of the crown, by having all the places in its disposal, hath so effectually swallowed up the power, and eaten out the virtue of the house of commons (the republican part in the constitution) that the government of England is nearly as monarchical as that of France or Spain. Men fall out with names without understanding them. For it is the republican and not the monarchical part of the constitution of England which Englishmen glory in, viz. the liberty of choosing an house of commons from out of their own body - and it is easy to see that when republican virtue fails, slavery ensues. Why is the constitution of England sickly, but because monarchy hath poisoned the republic, the crown hath engrossed the commons? Volumes have been written on the subject of the struggle between England and America. Men of all ranks have embarked in the controversy, from different motives, and with various designs; but all have been ineffectual, and the period of debate is closed. Arms, as the last resource, decide this contest; the appeal was the choice of the king, and the continent hath accepted the challenge. It hath been reported of the late Mr. Pelham (who tho' an able minister was not without his faults) that on his being attacked in the house of commons, on the score, that his measures were only of a temporary kind, replied "THEY WILL LAST MY TIME." Should a thought so fatal and unmanly possess the colonies in the present contest, the name of ancestors will be remembered by future generations with detestation. The sun never shined on a cause of greater worth. 'Tis not the affair of a city, a county, a province, or a kingdom, but of a continent - of at least one eighth part of the habitable globe. 'Tis not the concern of a day, a year, or an age; posterity are virtually involved in the contest, and will be more or less affected, even to the end of time, by the proceedings now. Now is the seed-time of continental union, faith and honour. The least fracture now will be like a name engraved with the point of a pin on the tender rind of a young oak; the wound will enlarge with the tree, and posterity read it in full grown characters. By referring the matter from argument to arms, a new aera for politics is struck; a new method of thinking hath arisen. All plans, proposals, &c. prior to the nineteenth of April, i. e. to the commencement of hostilities, are like the almanacs of the last year; which, though proper then are superseded and useless now. Whatever was advanced by the advocates on either side of the question then, terminated in one and the same point. viz. a union with Great-Britain: the only difference between the parties was the method of effecting it; the one proposing force, the other friendship; but it hath so far happened that the first hath failed, and the second hath withdrawn her influence. As much hath been said of the advantages of reconciliation which, like an agreeable dream, hath passed away and left us as we were, it is but right, that we should examine the contrary side of the argument, and inquire into some of the many material injuries which these colonies sustain, and always will sustain, by being connected with, and dependent on Great Britain: To examine that connection and dependence, on the principles of nature and common sense, to see what we have to trust to, if separated, and what we are to expect, if dependant. I have heard it asserted by some, that as America hath flourished under her former connection with Great Britain that the same connection is necessary towards her future happiness, and will always have the same effect. Nothing can be more fallacious than this kind of argument. We may as well assert that because a child has thrived upon milk that it is never to have meat, or that the first twenty years of our lives is to become a precedent for the next twenty. But even this is admitting more than is true, for I answer roundly, that America would have flourished as much, and probably much more, had no European power had any thing to do with her. The commerce, by which she hath enriched herself, are the necessaries of life, and will always have a market while eating is the custom of Europe. But she has protected us, say some. That she has engrossed us is true, and defended the continent at our expense as well as her own is admitted, and she would have defended Turkey from the same motive, viz. the sake of trade and dominion. Alas, we have been long led away by ancient prejudices, and made large sacrifices to superstition. We have boasted the protection of Great Britain, without considering, that her motive was INTEREST not ATTACHMENT; that she did not protect us from OUR ENEMIES on OUR ACCOUNT, but from HER ENEMIES on HER OWN ACCOUNT, from those who had no quarrel with us on any OTHER ACCOUNT, and who will always be our enemies on the SAME ACCOUNT. Let Britain wave her pretensions to the continent, or the continent throw off the dependence, and we should be at peace with France and Spain were they at war with Britain. The miseries of Hanover last war ought to warn us against connections. It has lately been asserted in parliament, that the colonies have no relation to each other but through the parent country, i. e. that Pennsylvania and the Jerseys, and so on for the rest, are sister colonies by the way of England; this is certainly a very round-about way of proving relationship, but it is the nearest and only true way of proving enemyship, if I may so call it. France and Spain never were. nor perhaps ever will be our enemies as AMERICANS, but as our being the subjects of GREAT BRITAIN. But Britain is the parent country, say some. Then the more shame upon her conduct. Even brutes do not devour their young, nor savages make war upon their families; wherefore the assertion, if true, turns to her reproach; but it happens not to be true, or only partly so and the phrase PARENT or MOTHER COUNTRY hath been jesuitically adopted by the king and his parasites, with a low papistical design of gaining an unfair bias on the credulous weakness of our minds. Europe, and not England, is the parent country of America. This new world hath been the asylum for the persecuted lovers of civil and religious liberty from EVERY PART of Europe. Hither have they fled, not from the tender embraces of the mother, but from the cruelty of the monster; and it is so far true of England, that the same tyranny which drove the first emigrants from home, pursues their descendants still. It is pleasant to observe by what regular gradations we surmount the force of local prejudice, as we enlarge our acquaintance with the world. A man born in any town in England divided into parishes, will naturally associate most with his fellow-parishioners (because their interests in many cases will be common) and distinguish him by the name of NEIGHBOUR; if he meet him but a few miles from home, he drops the narrow idea of a street, and salutes him by the name of TOWNSMAN; if he travel out of the county, and meet him in any other, he forgets the minor divisions of street and town, and calls him COUNTRYMAN, i. e. COUNTRYMAN; but if in their foreign excursions they should associate in France or any other part of EUROPE, their local remembrance would be enlarged into that of ENGLISHMEN. And by a just parity of reasoning, all Europeans meeting in America, or any other quarter of the globe, are COUNTRYMEN; for England, Holland, Germany, or Sweden, when compared with the whole, stand in the same places on the larger scale, which the divisions of street, town, and county do on the smaller ones; distinctions too limited for continental minds. Not one third of the inhabitants, even of this province, are of English descent. Wherefore I reprobate the phrase of parent or mother country applied to England only, as being false, selfish, narrow and ungenerous. But admitting, that we were all of English descent, what does it amount to? Nothing. Britain, being now an open enemy, extinguishes every other name and title: And to say that reconciliation is our duty, is truly farcical. The first king of England, of the present line (William the Conqueror) was a Frenchman, and half the Peers of England are descendants from the same country; therefore, by the same method of reasoning, England ought to be governed by France. Much hath been said of the united strength of Britain and the colonies, that in conjunction they might bid defiance to the world. But this is mere presumption; the fate of war is uncertain, neither do the expressions mean any thing; for this continent would never suffer itself to be drained of inhabitants, to support the British arms in either Asia, Africa, or Europe. Besides what have we to do with setting the world at defiance? Our plan is commerce, and that, well attended to, will secure us the peace and friendship of all Europe; because, it is the interest of all Europe to have America a FREE PORT. Her trade will always be a protection, and her barrenness of gold and silver secure her from invaders. I challenge the warmest advocate for reconciliation, to shew, a single advantage that this continent can reap, by being connected with Great Britain. I repeat the challenge, not a single advantage is derived. Our corn will fetch its price in any market in Europe, and our imported goods must be paid for, buy them where we will. But the injuries and disadvantages we sustain by that connection, are without number; and our duty to mankind at large, as well as to ourselves, instruct us to renounce the alliance: Because, any submission to, or dependence on Great Britain, tends directly to involve this continent in European wars and quarrels; and sets us at variance with nations, who would otherwise seek our friendship, and against whom, we have neither anger nor complaint. As Europe is our market for trade, we ought to form no partial connection with any part of it. It is the true interest of America to steer clear of European contentions, which she never can do, while by her dependence on Britain, she is made the make-weight in the scale of British politics. Europe is too thickly planted with kingdoms to be long at peace, and whenever a war breaks out between England and any foreign power, the trade of America goes to ruin, BECAUSE OF HER CONNECTION WITH ENGLAND. The next war may not turn out like the last, and should it not, the advocates for reconciliation now, will be wishing for separation then, because, neutrality in that case, would be a safer convoy than a man of war. Every thing that is right or natural pleads for separation. The blood of the slain, the weeping voice of nature cries, 'TIS TIME TO PART. Even the distance at which the Almighty hath placed England and America, is a strong and natural proof, that the authority of the one, over the other, was never the design of Heaven. The time likewise at which the continent was discovered, adds weight to the argument, and the manner in which it was peopled increases the force of it. The reformation was preceded by the discovery of America, as if the Almighty graciously meant to open a sanctuary to the Persecuted in future years, when home should afford neither friendship nor safety. The authority of Great Britain over this continent, is a form of government, which sooner or later must have an end: And a serious mind can draw no true pleasure by looking forward under the painful and positive conviction, that what he calls "the present constitution" is merely temporary. As parents, we can have no joy, knowing that THIS GOVERNMENT is not sufficiently lasting to ensure any thing which we may bequeath to posterity: And by a plain method of argument, as we are running the next generation into debt, we ought to do the work of it, otherwise we use them meanly and pitifully. In order to discover the line of our duty rightly, we should take our children in our hand, and fix our station a few years farther into life; that eminence will present a prospect, which a few present fears and prejudices conceal from our sight. Though I would carefully avoid giving unnecessary offense, yet I am inclined to believe, that all those who espouse the doctrine of reconciliation, may be included within the following descriptions. Interested men, who are not to be trusted; weak men, who CANNOT see; prejudiced men, who WILL NOT see; and a certain set of moderate men, who think better of the European world than it deserves; and this last class, by an ill-judged deliberation, will be the cause of more calamities to this continent, than all the other three. It is the good fortune of many to live distant from the scene of sorrow; the evil is not sufficient brought to their doors to make THEM feel the precariousness with which all American property is possessed. But let our imaginations transport us far a few moments to Boston, that seat of wretchedness will teach us wisdom, and instruct us for ever to renounce a power in whom we can have no trust. The inhabitants of that unfortunate city, who but a few months ago were in ease and affluence, have now, no other alternative than to stay and starve, or turn and beg. Endangered by the fire of their friends if they continue within the city, and plundered by the soldiery if they leave it. In their present condition they are prisoners without the hope of redemption, and in a general attack for their relief, they would be exposed to the fury of both armies. Men of passive tempers look somewhat lightly over the offenses of Britain, and, still hoping for the best, are apt to call out, "COME, COME, WE SHALL BE FRIENDS AGAIN, FOR ALL THIS." But examine the passions and feelings of mankind, Bring the doctrine of reconciliation to the touchstone of nature, and then tell me, whether you can hereafter love, honor, and faithfully serve the power that hath carried fire and sword into your land? If yon cannot do all these, then are you only deceiving yourselves, and by your delay bringing ruin upon posterity. Your future connection with Britain, whom you can neither love nor honor will be forced and unnatural, and being formed only on the plan of present convenience, will in a little time fall into a relapse more wretched than the first. But if you say, you can still pass the violations over, then I ask, Hath your house been burnt? Hath your property been destroyed before your face! Are your wife and children destitute of a bed to lie on, or bread to live on? Have you lost a parent or a child by their hands, and yourself the ruined and wretched survivor! If you have not, then are you not a judge of those who have. But if you have, and still can shake hands with the murderers, then are you unworthy the name of husband, father, friend, or lover, and whatever may be your rank or title in life, you have the heart of a coward, and the spirit of a sycophant. It is repugnant to reason, to the universal order of things, to all examples from former ages, to suppose, that this continent can longer remain subject to any external power. The most sanguine in Britain does not think so. The utmost stretch of human wisdom cannot, at this time, compass a plan short of separation, which can promise the continent even a year's security. Reconciliation is NOW a fallacious dream. Nature hath deserted the connection, and Art cannot supply her place. For, as Milton wisely expresses, "never can true reconcilement grow, where wounds of deadly hate have pierced so deep." Every quiet method for peace hath been ineffectual. Our prayers have been rejected with disdain; and only tended to convince us, that nothing Batters vanity, or confirms obstinacy in Kings more than repeated petitioning-and nothing hath contributed more than that very measure to make the Kings of Europe absolute: Witness Denmark and Sweden. Wherefore, since nothing but blows will do, for God's sake, let us come to a final separation, and not leave the next generation to be cutting throats, under the violated unmeaning names of parent and child. To say, they will never attempt it again is idle and visionary, we thought so at the repeal of the stamp-act, yet a year or two undeceived us; as well may we suppose that nations, which have been once defeated, will never renew the quarrel. As to government matters, it is not in the power of Britain to do this continent justice: The business of it will soon be too weighty, and intricate, to be managed with any tolerable degree of convenience, by a power so distant from us, and so very ignorant of us; for if they cannot conquer us, they cannot govern us. To be always running three or four thousand miles with a tale or a petition, waiting four or five months for an answer, which when obtained requires five or six more to explain it in, will in a few years be looked upon as folly and childishness--There was a time when it was proper, and there is a proper time for it to cease. Small islands not capable of protecting themselves, are the proper objects for kingdoms to take under their care; but there is something very absurd, in supposing a continent to be perpetually governed by an island. In no instance hath nature made the satellite larger than its primary planet, and as England and America, with respect to each other, reverses the common order of nature, it is evident they belong to different systems; England to Europe, America to itself. I am not induced by motives of pride, party, or resentment to espouse the doctrine of separation and independance; I am clearly, positively, and conscientiously persuaded that it is the true interest of this continent to be so; that every thing short of THAT is mere patchwork, that it can afford no lasting felicity, --that it is leaving the sword to our children, and shrinking back at a time, when, a little more, a little farther, would have rendered this continent the glory of the earth. The object, contended for, ought always to bear some just proportion to the expense. The removal of North, or the whole detestable junto, is a matter unworthy the millions we have expended. A temporary stoppage of trade, was an inconvenience, which would have sufficiently balanced the repeal of all the acts complained of, had such repeals been obtained; hut if the whole continent must take up arms, if every man must be a soldier, it is scarcely worth our while to fight against a contemptible ministry only. Dearly, dearly, do we pay for the repeal of the acts, if that is all we fight for; for in a just estimation, it is as great a folly to pay a Bunker-hill price for law, as for land. As I have always considered the independancy of this continent, as an event, which sooner or later must arrive, so from the late rapid progress of the continent to maturity, the event could not be far off. Wherefore, on the breaking out of hostilities, it was not worth while to have disputed a matter, which time would have finally redressed, unless we meant to be in earnest; otherwise, it is like wasting an estate on a suit at law, to regulate the trespasses of a tenant, whose lease is just expiring. No man was a warmer wisher for reconciliation than myself, before the fatal nineteenth of April 1775, but the moment the event of that day was made known, I rejected the hardened, sullen tempered Pharaoh of England for ever; and disdain the wretch, that with the pretended title of FATHER OF HIS PEOPLE can unfeelingly hear of their slaughter, and composedly sleep with their blood upon his soul. FIRST. The powers of governing still remaining in the hands of the king, he will have a negative over the whole legislation of this continent. And as he hath shewn himself such an inveterate enemy to liberty. and discovered such a thirst for arbitrary power; is he, or is he not, a proper man to say to these colonies, "YOU SHALL MAKE NO LAWS BUT WHAT I PLEASE.' And is there any inhabitant in America so ignorant as not to know, that according to what is called the PRESENT CONSTITUTION, that this continent can make no laws but what the king gives leave to; and is there any man so unwise, as not to see, that (considering what has happened) he will suffer no law to be made here, but such as suit HIS purpose. We may be as effectually enslaved by the want of laws in America, as by submitting to laws made for us in England. After matters are made up (as it is called) can there be any doubt, but the whole power of the crown will be exerted, to keep this continent as low and humble as possible? Instead of going forward we shall go backward, or be perpetually quarrelling or ridiculously petitioning. --WE are already greater than the king wishes us to be, and will he not hereafter endeavour to make us less? To bring the matter to one point. Is the power who is jealous of our prosperity, a proper power to govern us? Whoever says No to this question, is an INDEPENDANT, for independancy means no more, than, whether we shall make our own laws, or whether the king, the greatest enemy this continent hath, or can have, shall tell us "THERE SHALL BE NO LAWS BUT SUCH AS I LIKE." But the king you will say has a negative in England; the people there can make no laws without his consent. In point of right and good order, there is something very ridiculous, that a youth of twenty-one (which hath often happened) shall say to several millions of people, older and wiser than himself, I forbid this or that act of yours to be law. But in this place I decline this sort of reply, though I will never cease to expose the absurdity of it, and only answer, that England being the King's residence, and America not so, makes quite another case. The king's negative HERE is ten times more dangerous and fatal than it can be in England, for THERE he will scarcely refuse his consent to a bill for putting England into as strong a state of defense as possible, and in America he would never suffer such a bill to be passed. America is only a secondary object in the system of British politics, England consults the good of THIS country, no farther than it answers her OWN purpose. Wherefore, her own interest leads her to suppress the growth of OURS in every case which doth not promote her advantage, or in the least interferes with it. A pretty state we should soon be in under such a secondhand government, considering what has happened! Men do not change from enemies to friends by the alteration of a name: And in order to shew that reconciliation now is a dangerous doctrine, I affirm, THAT IT WOULD BE POLICY IN THE KING AT THIS TIME, TO REPEAL THE ACTS FOR THE SAKE OF REINSTATING HIMSELF IN THE GOVERNMENT OF THE PROVINCES; in order, that HE MAY ACCOMPLISH BY CRAFT AND SUBTLETY, IN THE LONG RUN, WHAT HE CANNOT DO BY FORCE AND VIOLENCE IN THE SHORT ONE. Reconciliation and ruin are nearly related. SECONDLY. That as even the best terms, which we can expect to obtain, can amount to no more than a temporary expedient, or a kind of government by guardianship, which can last no longer than till the colonies come of age, so the general face and state of things, in the interim, will be unsettled and unpromising. Emigrants of property will not choose to come to a country whose form of government hangs but by a thread, and who is every day tottering on the brink of commotion and disturbance; and numbers of the present inhabitants would lay hold of the interval, to dispense of their effects, and quit the continent. But the most powerful of all arguments, is, that nothing but independence, i.e. a continental form of government, can keep the peace of the continent and preserve it inviolate from civil wars. I dread the event of a reconciliation with Britain now, as it is more than probable, that it will be followed by a revolt somewhere or other, the consequences of which may be far more fatal than all the malice of Britain. Thousands are already ruined by British barbarity; (thousands more will probably suffer the same fate) Those men have other feelings than us who have nothing suffered. All they NOW possess is liberty, what they before enjoyed is sacrificed to its service, and having nothing more to lose, they disdain submission. Besides, the general temper of the colonies, towards a British government, will be like that of a youth, who is nearly out of his time; they will care very little about her. And a government which cannot preserve the peace, is no government at all, and in that case we pay our money for nothing; and pray what is it that Britain can do, whose power will he wholly on paper. should a civil tumult break out the very day after reconciliation! I have heard some men say, many of whom I believe spoke without thinking, that they dreaded an independence, fearing that it would produce civil wars. It is but seldom that our first thoughts are truly correct, and that is the case here; for there are ten times more to dread from a patched up connection than from independence. I make the sufferers case my own, and I protest, that were I driven from house and home, my property destroyed, and my circumstances ruined, that as man, sensible of injuries, I could never relish the doctrine of reconciliation, or consider myself bound thereby. Where there are no distinctions there can be no superiority, perfect equality affords no temptation. The republics of Europe are all (and we may say always) in peace. Holland and Switzerland are without wars, foreign or domestic: Monarchical governments, it is true, are never long at rest; the crown itself is a temptation to enterprising ruffians at HOME; and that degree of pride and insolence ever attendant on regal authority, swells into a rupture with foreign powers, in instances, where a republican government, by being formed on more natural principles, would negotiate the mistake. If there is any true cause of fear respecting independence, it is because no plan is yet laid down. Men do not see their way out-- Wherefore, as an opening into that business, I offer the following hints; at the same time modestly affirming, that I have no other opinion of them myself, than that they may be the means of giving rise to something better. Could the straggling thoughts of individuals be collected, they would frequently form materials for wise and able men to improve into useful matter. 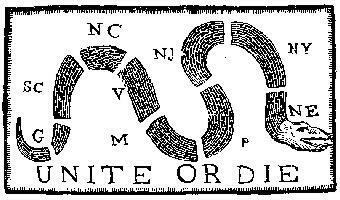 Let each colony be divided into six, eight, or ten, convenient districts, each district to send a proper number of delegates to Congress, so that each colony send at least thirty. The whole number in Congress will be at least 390. Each Congress to sit and to choose a president by the following method. When the delegates are met, let a colony be taken from the whole thirteen colonies by lot, after which, let the whole Congress choose (by ballot) a president from out of the delegates of that province. In the next Congress, let a colony be taken by lot from twelve only, omitting that colony from which the president was taken in the former Congress, and so proceeding on till the whole thirteen shall have had their proper rotation. And in order that nothing may pass into a law but what is satisfactorily just not less than three fifths of the Congress to be called a majority-- He that will promote discord, under a government so equally formed as this, would have joined Lucifer in his revolt. But as there is a peculiar delicacy, from whom, or in what manner, this business must first arise, and as it seems most agreeable and consistent, that it should come from some intermediate body between the governed and the governors, that is, between the Congress and the people. let a CONTINENTAL CONFERENCE be held, in the following manner, and for the following purpose. A committee of twenty-six members of Congress, viz. two for each colony. Two Members from each House of Assembly, or Provincial Convention; and five representatives of the people at large, to be chosen in the capital city or town of each province, for and in behalf of the whole province, by as many qualified voters as shall think proper to attend from all parts of the province for that purpose; or, if more convenient, the representatives may be chosen in two or three of the most populous parts thereof. In this conference, thus assembled, will be united, the two grand principles of business KNOWLEDGE and POWER. The members of Congress, Assemblies, or Conventions, by having had experience in national concerns, will be able and useful counsellors, and the whole, being empowered by the people, will have a truly legal authority. The conferring members being met, let their business be to frame a CONTINENTAL CHARTER, Or Charter of the United Colonies; (answering to what is called the Magna Carta of England) fixing the number and manner of choosing members of Congress, members of Assembly, with their date of sitting, and drawing the line of business and jurisdiction between them: (Always remembering, that our strength is continental, not provincial:) Securing freedom and property to all men, and above all things, the free exercise of religion, according to the dictates of conscience; with such other matter as is necessary for a charter to contain. Immediately after which, the said Conference to dissolve, and the bodies which shall be chosen comformable to the said charter, to be the legislators and governors of this continent for the time being: Whose peace and happiness may God preserve, Amen. But where, says some, is the King of America? I'll tell you. Friend, he reigns above, and doth not make havoc of mankind like the Royal Brute of Britain. Yet that we may not appear to be defective even in earthly honors, let a day be solemnly set apart for proclaiming the charter; let it be brought forth placed on the divine law, the word of God; let a crown be placed thereon, by which the world may know, that so far we approve of monarchy, that in America THE LAW IS KING. For as in absolute governments the King is law, so in free countries the law OUGHT to be King; and there ought to be no other. But lest any ill use should afterwards arise, let the crown at the conclusion of the ceremony, be demolished, and scattered among the people whose right it is. A government of our own is our natural right: And when a man seriously reacts on the precariousness of human affairs, he will become convinced, that it is infinitely wiser and safer, to form a constitution of our own in a cool deliberate manner, while we have it in our power, than to trust such an interesting event to time and chance. If we omit it now, some [Thomas Anello otherwise Massanello a fisherman of Naples, who after spiriting up his countrymen in the public marketplace, against the oppressions of the Spaniards, to whom the place was then subject prompted them to revolt, and in the space of a day became king.] Massanello may hereafter arise, who laying hold of popular disquietudes, may collect together the desperate and the discontented, and by assuming to themselves the powers of government, may sweep away the liberties of the continent like a deluge. Should the government of America return again into the hands of Britain, the tottering situation of things will be a temptation for some desperate adventurer to try his fortune; and in such a case, that relief can Britain give? Ere she could hear the news, the fatal business might be done; and ourselves suffering like the wretched Britons under the oppression of the Conqueror. Ye that oppose independence now, ye know not what ye do; ye are opening a door to eternal tyranny, by keeping vacant the seat of government. There are thousands, and tens of thousands, who would think it glorious to expel from the continent that barbarous and hellish power, which hath stirred up the Indians and Negroes to destroy us; the cruelty hath a double guilt, it is dealing brutally by us, and treacherously by them. Ye that tell us of harmony and reconciliation, can ye restore to us the time that is past? Can ye give to prostitution its former innocence? Neither can ye reconcile Britain and America. The last cord now is broken, the people of England are presenting addresses against us. There are injuries which nature cannot forgive; she would cease to be nature if she did. As well can the lover forgive the ravisher of his mistress, as the continent forgive the murders of Britain. The Almighty hath implanted in us these unextinguishable feelings for good and wise purposes. They are the guardians of his image in our hearts. They distinguish us from the herd of common animals. The social compact would dissolve, and justice be extirpated the earth, or have only a casual existence were we callous to the touches of affection. The robber, and the murderer, would often escape unpunished, did not the injuries which our tempers sustain, provoke us into justice. O ye that love mankind! Ye that dare oppose, not only the tyranny, but the tyrant, stand forth! Every spot of the old world is overrun with oppression. Freedom hath been hunted round the globe. Asia, and Africa, have long expelled her--Europe regards her like a stranger, and England hath given her warning to depart. O! receive the fugitive, and prepare in time an asylum for mankind. I have never met with a man, either in England or America, who hath not confessed his opinion that a separation between the countries, would take place one time or other: And there is no instance, in which we have shewn less judgement, than in endeavouring to describe, what we call the ripeness or fitness of the Continent for independence. As all men allow the measure, and vary only in their opinion of the time, let us, in order to remove mistakes, take a general survey of things, and endeavour, if possible, to find out the VERY time. But we need not go far, the inquiry ceases at once, for, the TIME HATH FOUND US. The general concurrence, the glorious union of all things prove the fact. It is not in numbers, but in unity, that our great strength lies; yet our present numbers are sufficient to repel the force of all the world. The Continent hath, at this time, the largest body of armed and disciplined men of any power under Heaven; and is just arrived at that pitch of strength, in which no single colony is able to support itself, and the whole, when united, can accomplish the matter, and either more, or, less than this, might be fatal in its effects. Our land force is already sufficient, and as to naval affairs, we cannot be insensible, that Britain would never suffer an American man of war to be built, while the continent remained in her hands. Wherefore, we should be no forwarder an hundred years hence in that branch, than we are now; but the truth is, we should be less so, because the timber of the country is every day diminishing, and that, which will remain at last, will be far off and difficult to procure. Were the continent crowded with inhabitants, her sufferings under the present circumstances would be intolerable. The more seaport towns we had, the more should we have both to defend and to lose. Our present numbers are so happily proportioned to our wants, that no man need be idle. The diminution of trade affords an army, and the necessities of an army create a new trade. Debts we have none; and whatever we may contract on this account will serve as a glorious memento of our virtue. Can we but leave posterity with a settled form of government, an independent constitution of its own, the purchase at any price will be cheap. But to expend millions for the sake of getting a few vile acts repealed, and routing the present ministry only, is unworthy the charge, and is using posterity with the utmost cruelty; because it is leaving them the great work to do, and a debt upon their backs, from which they derive no advantage. Such a thought is unworthy of a man of honor, and is the true characteristic of a narrow heart and a peddling politician. The debt we may contract doth not deserve our regard, if the work be but accomplished. No nation ought to be without a debt. A national debt is a national bond; and when it bears no interest, is in no case a grievance. Britain is oppressed with a debt of upwards of one hundred and forty millions sterling, for which she pays upwards of four millions interest. And as a compensation for her debt, she has a large navy; America is without a debt, and without a navy; yet for the twentieth part of the English national debt, could have a navy as large again. The navy of England is not worth, at this time, more than three millions and an half sterling. The charge of building a ship of each rate, and furnishing her with masts, yards, sails and rigging, together with a proportion of eight months boatswain's and carpenter's seastores, as calculated by Mr. Burchett, Secretary to the navy. No country on the globe is so happily situated, or so internally capable of raising a fleet as America. Tar, timber, iron, and cordage are her natural produce. We need go abroad for nothing. Whereas the Dutch, who make large profits by hiring out their ships of war to the Spaniards and Portuguese, are obliged to import most of their materials they use. We ought to view the building a fleet as an article of commerce, it being the natural manufactory of this country. It is the best money we can lay out. A navy when finished is worth more than it cost. And is that nice point in national policy, in which commerce and protection are united. Let us build; if we want them not, we can sell; and by that means replace our paper currency with ready gold and silver. In point of manning a fleet, people in general run into great errors; it is not necessary that one fourth part should he sailors. The Terrible privateer, Captain Death, stood the hottest engagement of any ship last war, yet had not twenty sailors on board, though her complement of men was upwards of two hundred. A few able and social sailors will soon instruct a sufficient number of active landmen in the common work of a ship. Wherefore, we never can be more capable to begin on maritime matters than now, while our timber is standing, our fisheries blocked up, and our sailors and shipwrights out of employ. Men of war of seventy and eighty guns were built forty years ago in New-England, and why not the same now? Ship-building is America's greatest pride, and in which she will in time excel the whole world. The great empires of the east are mostly inland, and consequently excluded from the possibility of rivalling her. Africa is in a state of barbarism; and no power in Europe hath either such an extent of coast, or such an internal supply of materials. Where nature hath given the one, she has withheld the other; to America only hath she been liberal of both. The vast empire of Russia is almost shut out from the sea: wherefore, her boundless forests, her tar, iron, and cordage are only articles of commerce. In point of safety, ought we to be without a fleet? We are not the little people now, which we were sixty years ago; at that time we might have trusted our property in the streets, or fields rather; and slept securely without locks or bolts to our doors or windows. The case now is altered, and our methods of defense ought to improve with our increase of property. A common pirate, twelve months ago, might have come up the Delaware, and laid the city of Philadelphia under instant contribution, for what sum he pleased; and the same might have happened to other places. Nay, any daring fellow, in a brig of fourteen or sixteen guns might have robbed the whole continent, and carried off half a million of money. These are circumstances which demand our attention, and point out the necessity of naval protection. Some, perhaps, will say, that after we have made it up Britain, she will protect us. Can we be so unwise as to mean, that she shall keep a navy in our harbours for that purpose? Common sense will tell us, that the power which hath endeavoured to subdue us, is of all others the most improper to defend us. Conquest may be effected under the pretence of friendship; and ourselves after a long and brave resistance, be at last cheated into slavery. And if her ships are not to be admitted into our harbours, I would ask, how is she to protect us? A navy three or four thousand miles off can be of little use, and on sudden emergencies, none at all. Wherefore, if we must hereafter protect ourselves, why not do it for ourselves? The English list of ships of war, is long and formidable, but not a tenth part of them are at any one time fit for service, numbers of them not in being; yet their names are pompously continued in the list, f only a plank be left of the ship: and not a fifth part of such as are fit for service, can be spared on any one station at one time. The East and West Indies, Mediterranean, Africa, and other parts over which Britain extends her claim, make large demands upon her navy. From a mixture of prejudice and inattention, we have contracted a false notion respecting the navy of England, and have talked as if we should have the whole of it to encounter at once, and for that reason, supposed, that we must have one as large; which not being instantly practicable, have been made use of by a set of disguised Tories to discourage our beginning thereon. Nothing can be farther from truth than this; for if America had only a twentieth part of the naval force of Britain, she would be by far an overmatch for her; because, as we neither have, nor claim any foreign dominion, our whole force would be employed on our own coast, where we should, in the long run, have two to one the advantage of those who had three or four thousand miles to sail over, before they could attack us, and the same distance to return in order to refit and recruit. And although Britain, by her fleet, hath a check over our trade to Europe, we have as large a one over her trade to the West Indies, which, by laying in the neighbourhood of the continent, is entirely at its mercy. Some method might be fallen on to keep up a naval force in time of peace, if we should not judge it necessary to support a constant navy. If premiums were to be given to merchants, to build and employ in their service ships mounted with twenty, thirty, forty or fifty guns, (the premiums to be in proportion to the loss of bulk to the merchants) fifty or sixty of those ships, with a few guardships on constant duty, would keep up a sufficient navy, and that without burdening ourselves with the evil so loudly complained of in England, of suffering their fleet, in time of peace to lie rotting in the docks. To unite the sinews of commerce and defense is sound policy; for when our strength and our riches play into each other's hand, we need fear no external enemy. In almost every article of defense we abound. Hemp flourishes even to rankness, so that we need not want cordage. Our iron is superior to that of other countries. Our small arms equal to any in the world. Cannon we can cast at pleasure. Saltpetre and gunpowder we are every day producing. Our knowledge is hourly improving. Resolution is our inherent character, and courage hath never yet forsaken us. Wherefore, what is it that we want? Why is it that we hesitate? From Britain we can expect nothing but ruin. If she is once admitted to the government of America again, this Continent will not be worth living in. Jealousies will be always arising; insurrections will be constantly happening; and who will go forth to quell them? Who will venture his life to reduce his own countrymen to a foreign obedience? The difference between Pennsylvania and Connecticut, respecting some unlocated lands, shews the insignificance of a British government, and fully proves, that nothing but Continental authority can regulate Continental matters. Another reason why the present time is preferable to all others, is, that the fewer our numbers are, the more land there is yet unoccupied, which instead of being lavished by the king on his worthless dependants, may be hereafter applied, not only to the discharge of the present debt, but to the constant support of government. No nation under heaven hath such an advantage at this. 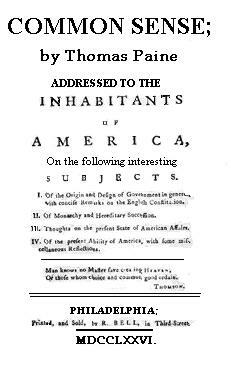 The infant state of the Colonies, as it is called, so far from being against, is an argument in favour of independance. We are sufficiently numerous, and were we more so, we might be less united. It is a matter worthy of observation, that the mare a country is peopled, the smaller their armies are. In military numbers, the ancients far exceeded the modems: and the reason is evident. for trade being the consequence of population, men become too much absorbed thereby to attend to anything else. Commerce diminishes the spirit, both of patriotism and military defence. And history sufficiently informs us, that the bravest achievements were always accomplished in the non-age of a nation. With the increase of commerce, England hath lost its spirit. The city of London, notwithstanding its numbers, submits to continued insults with the patience of a coward. The more men have to lose, the less willing are they to venture. The rich are in general slaves to fear, and submit to courtly power with the trembling duplicity of a Spaniel. Youth is the seed time of good habits, as well in nations as in individuals. It might be difficult, if not impossible, to form the Continent into one government half a century hence. The vast variety of interests, occasioned by an increase of trade and population, would create confusion. Colony would be against colony. Each being able might scorn each other's assistance: and while the proud and foolish gloried in their little distinctions, the wise would lament, that the union had not been formed before. Wherefore, the PRESENT TIME is the TRUE TIME for establishing it. The intimacy which is contracted in infancy, and the friendship which is formed in misfortune, are, of all others, the most lasting and unalterable. Our present union is marked with both these characters: we are young and we have been distressed; but our concord hath withstood our troubles, and fixes a memorable are for posterity to glory in. The present time, likewise, is that peculiar time, which never happens to a nation but once, viz. the time of forming itself into a government. Most nations have let slip the opportunity, and by that means have been compelled to receive laws from their conquerors, instead of making laws for themselves. First, they had a king, and then a form of government; whereas, the articles or charter of government, should be formed first, and men delegated to execute them afterward but from the errors of other nations, let us learn wisdom, and lay hold of the present opportunity --TO BEGIN GOVERNMENT AT THE RIGHT END. When William the Conqueror subdued England, he gave them law at the point of the sword; and until we consent, that the seat of government, in America, be legally and authoritatively occupied, we shall be in danger of having it filled by some fortunate ruffian, who may treat us in the same manner, and then, where will be our freedom? where our property? As to religion, I hold it to be the indispensable duty of all government, to protect all conscientious professors thereof, and I know of no other business which government hath to do therewith, Let a man throw aside that narrowness of soul, that selfishness of principle, which the niggards of all professions are willing to part with, and he will be at delivered of his fears on that head. Suspicion is the companion of mean souls, and the bane of all good society. For myself, I fully and conscientiously believe, that it is the will of the Almighty, that there should be diversity of religious opinions among us: It affords a larger field for our Christian kindness. Were we all of one way of thinking, our religious dispositions would want matter for probation; and on this liberal principle, I look on the various denominations among us, to be like children of the same family, differing only, in what is called, their Christian names. In page forty, I threw out a few thoughts on the propriety of a Continental Charter, (for I only presume to offer hints, not plans) and in this place, I take the liberty of rementioning the subject, by observing, that a charter is to be understood as a bond of solemn obligation, which the whole enters into, to support the right of every separate part, whether of religion, personal freedom, or property. A firm bargain and a right reckoning make long friends. In a former page I likewise mentioned the necessity of a large and equal representation; and there is no political matter which more deserves our attention. A small number of electors, or a small number of representatives, are equally dangerous. But if the number of the representatives be not only small, but unequal, the danger is increased. As an instance of this, I mention the following; when the Associators petition was before the House of Assembly of Pennsylvania; twenty-eight members only were present, all the Bucks county members, being eight, voted against it, and had seven of the Chester members done the same, this whole province had been governed by two counties only, and this danger it is always exposed to. The unwarrantable stretch likewise, which that house made in their last sitting, to gain an undue authority over the delegates of that province, ought to warn the people at large, how they trust power out of their own hands. A set of instructions for the Delegates were put together, which in point of sense and business would have dishonoured a schoolboy, and after being approved by a FEW, a VERY FEW without doors, were carried into the House, and there passed IN BEHALF OF THE WHOLE COLONY; whereas, did the whole colony know, with what ill-will that House hath entered on some necessary public measures, they would not hesitate a moment to think them unworthy of such a trust. Immediate necessity makes many things convenient, which if continued would grow into oppressions. Expedience and right are different things. When the calamities of America required a consultation, there was no method so ready, or at that time so proper, as to appoint persons from the several Houses of Assembly for that purpose; and the wisdom with which they have proceeded hath preserved this continent from ruin. But as it is more than probable that we shall never be without a CONGRESS, every well wisher to good order, must own, that the mode for choosing members of that body, deserves consideration. And I put it as a question to those, who make a study of mankind, whether representation and election is not too great a power for one and the same body of men to possess? When we are planning for posterity, we ought to remember, that virtue is not hereditary. FIRST. -- It is the custom of nations, when any two are at war, for some other powers, not engaged in the quarrel, to step in as mediators, and bring about the preliminaries of a peace: hut while America calls herself the Subject of Great Britain, no power, however well disposed she may be, can offer her mediation. Wherefore, in our present state we may quarrel on for ever. SECONDLY. -- It is unreasonable to suppose, that France or Spain will give us any kind of assistance, if we mean only, to make use of that assistance for the purpose of repairing the breach, and strengthening the connection between Britain and America; because, those powers would be sufferers by the consequences. THIRDLY. -- While we profess ourselves the subjects of Britain, we must, in the eye of foreign nations. be considered as rebels. The precedent is somewhat dangerous to THEIR PEACE, for men to be in arms under the name of subjects; we, on the spot, can solve the paradox: but to unite resistance and subjection, requires an idea much too refined for common understanding. FOURTHLY. -- Were a manifesto to be published, and despatched to foreign courts, setting forth the miseries we have endured, and the peaceable methods we have ineffectually used for redress; declaring, at the same time, that not being able, any longer, to live happily or safely under the cruel disposition of the British court, we had been driven to the necessity of breaking off all connections with her; at the same time, assuring all such courts of our peaceable disposition towards them, and of our desire of entering into trade with them: Such a memorial would produce more good effects to this Continent, than if a ship were freighted with petitions to Britain. Under our present denomination of British subjects, we can neither be received nor heard abroad: The custom of all courts is against us, and will be so, until, by an independance, we take rank with other nations. Sir John Dalrymple, the putative father of a whining jesuitical piece, fallaciously called, "THE ADDRESS OF THE PEOPLE OF _ENGLAND_ TO THE INHABITANTS OF _AMERICA_," hath, perhaps, from a vain supposition, that the people here were to be frightened at the pomp and description of a king, given, (though very unwisely on his part) the real character of the present one: "But" says this writer, "if you are inclined to pay compliments to an administration, which we do not complain of," (meaning the Marquis of Rockingham's at the repeal of the Stamp Act) "it is very unfair in you to withhold them from that prince by WHOSE _NOD ALONE_ THEY WERE PERMITTED TO DO ANY THING." This is toryism with a witness! Here is idolatry even without a mask: And he who can calmly hear, and digest such doctrine, hath forfeited his claim to rationality an apostate from the order of manhood; and ought to be considered as one, who hath not only given up the proper dignity of man, but sunk himself beneath the rank of animals, and contemptibly crawl through the world like a worm. He who takes nature for his guide is not easily beaten out of his argument, and on that ground, I answer GENERALLY--THAT _INDEPENDANCE_ BEING A _SINGLE SIMPLE LINE,_ CONTAINED WITHIN OURSELVES; AND RECONCILIATION, A MATTER EXCEEDINGLY PERPLEXED AND COMPLICATED, AND IN WHICH, A TREACHEROUS CAPRICIOUS COURT IS TO INTERFERE, GIVES THE ANSWER WITHOUT A DOUBT. On these grounds I rest the matter. And as no offer hath yet been made to refute the doctrine contained in the former editions of this pamphlet, it is a negative proof, that either the doctrine cannot be refuted, or, that the party in favour of it are too numerous to be opposed. WHEREFORE, instead of gazing at each other with suspicious or doubtful curiosity; let each of us, hold out to his neighbour the hearty hand of friendship, and unite in drawing a line, which, like an act of oblivion shall bury in forgetfulness every former dissension. Let the names of Whig and Tory be extinct; and let none other be heard among us, than those of A GOOD CITIZEN, AN OPEN AND RESOLUTE FRIEND, AND A VIRTUOUS SUPPORTER OF THE RIGHTS OF MANKIND AND OF THE _FREE AND INDEPENDANT STATES OF AMERICA_. O ye partial ministers of your own acknowledged principles. If the bearing arms be sinful, the first going to war must be more so, by all the difference between wilful attack, and unavoidable defence. Wherefore, if ye really preach from conscience, and mean not to make a political hobbyhorse of your religion convince the world thereof, by proclaiming your doctrine to our enemies, FOR THEY LIKEWISE BEAR _ARMS_. Give us proof of your sincerity by publishing it at St. James's, to the commanders in chief at Boston, to the Admirals and Captains who are piratically ravaging our coasts, and to all the murdering miscreants who are acting in authority under HIM whom ye profess to serve. Had ye the honest soul of BARCLAY ye would preach repentance to YOUR king; Ye would tell the Royal Wretch his sins, and warn him of eternal ruin. ["Thou hast tasted of prosperity and adversity; thou knowest what it is to be banished thy native country, to be over-ruled as well as to rule, and set upon the throne; and being oppressed thou hast reason to know how hateful the oppressor is both to God and man: If after all these warnings and advertisements, thou dost not turn unto the Lord with all thy heart, but forget him who remembered thee in thy distress, and give up thyself to fallow lust and vanity, surely great will be thy condemnation.-- Against which snare, as well as the temptation of those who may or do feed thee, and prompt thee to evil, the most excellent and prevalent remedy will be, to apply thyself to that light of Christ which shineth in thy conscience, and which neither can, nor will flatter thee, nor suffer thee to be at ease in thy sins." --Barclay's address to Charles II.] Ye would not spend your partial invectives against the injured and the insulted only, but, like faithful ministers, would cry aloud and SPARE NONE. Say not that ye are persecuted, neither endeavour to make us the authors of that reproach, which, ye are bringing upon yourselves; for we testify unto all men, that we do not complain against you because ye are Quakers, but because ye pretend to be and are NOT Quakers.